No one knows exactly how long the two French Gobelins tapestries had hung in Marple Hall when they were described by caretaker Frank Tunstall in "A short history of Marple Hall from 1606", written by him for guided tours of the hall in the 1920s. "On the principal walls of the Drawing room hang two large pieces of Gobelin tapestry. The design of the piece over the fireplace represent the goddess Diana, with weapons of the chase and the god Bacchus surrounded by a vine tree and fruit, holding up a wreath of roses, lilies and other flowers. Louis XIV is also depicted on horseback hunting a stag with hounds. The piece on the opposite wall is of similar size. It depicts a stony and desolate background, with a river and a deserted chateau, in the foreground is a design of vegetables and dead game. At the centre, in clouds, are the goddess of pleasure holding a wine cup and a winged Father Time with a goblet and wine cup overturned at his feet." 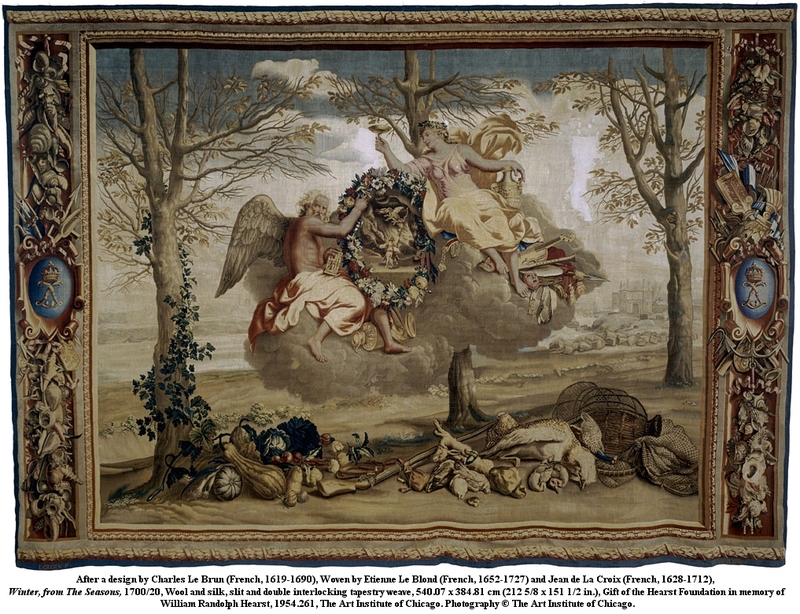 The tapestries were created as part of a set of four representing the seasons by the Gobelins weaving factory in Paris, c1710. They were known to have been sent to the Duke de Nivernois to decorate the French Embassy in Rome in 1748 and were believed to have been given in 1789 to the Marquis de Stainville, the French foreign minister who dominated the government of King Louis XV. Sometime after these illustrious beginnings they found their way to ancient Marple Hall, home of the Bradshawe-Isherwood family. Winter tapestry in the Drawing Room of Marple Hall from the 1929 for the auction catalogue. Hover image for a coloured version and click image for a larger version. Follow this link to the Art Institute site to learn more. The tapestries were certainly at Marple Hall by 1837, as they are mentioned by Charles Bellairs in the full version of his journal. At that time they were in a bedroom, which Charles described as "larger than any room in the house and using two stories, with an open roof." This room, with contents that were described by Bellairs in great wonder, is only mentioned in passing by Frank Tunstall in his guide as "a room leading to the roof". Obviously things had changed greatly over the intervening years. By the time that J. P. Earwaker, author of "East Cheshire Past and Present", visited the hall in 1880 the tapestries had been moved to the Drawing Room and with total disregard for their history or value one of them was cut to to fit around the fireplace. Timing suggests that this incredible deed was carried out by Thomas Bradshawe-Isherwood IV or his wife Mary Ellen (Charles Bellairs' sister) as they were custodians of the hall from 1839 to 1886. As far as we can tell little changed in the Drawing Room of Marple Hall until the auction of 1929, when the hall's treasures and heirlooms collected over hundreds of years were sold off to the highest bidder in two days. The two tapestries were sold on the second day of the sale and attracted huge interest, with one buyer coming all the way from Spain. However, we know from local newspaper reports that they were sold to a London Dealer for the sum of 600 guineas each. The severed portion of the tapestry that had been cut around the fireplace was included in the lot. 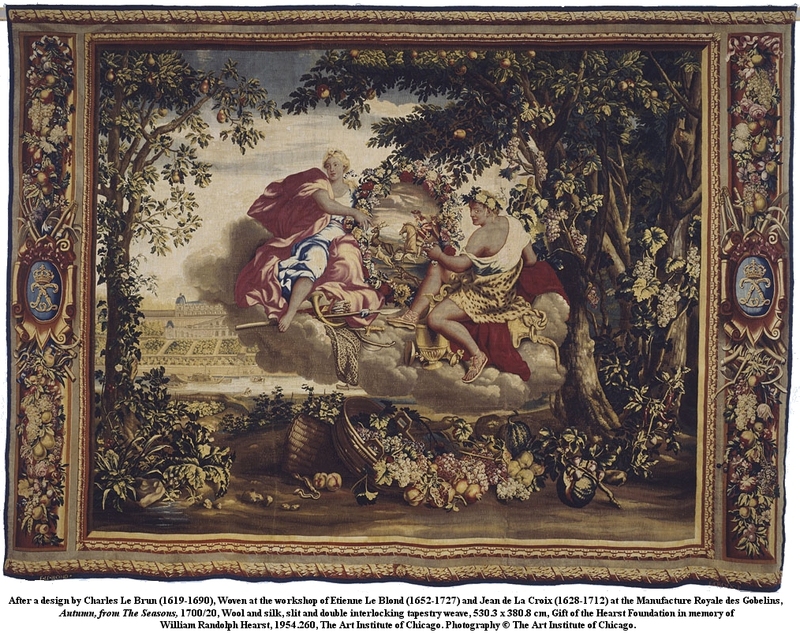 The same newspaper report tells us that the tapestries representing Spring and Summer were at that time known to be in the Royal Palace of Fontainebleau! Autumn tapestry in the Drawing Room of Marple Hall from the 1929 for the auction catalogue. Can you see the line where the severed section has been restored in the colour picture? We now know that Henry Symons, the London dealer who purchased the tapestries, sold them on in 1930 to none other than William Randolph Hearst, the multi-millionaire American newspaper magnate and inspiration for Orson Welles' film Citizen Kane. Maybe Hearst purchased the tapestries to decorate his castle but in 1954, three years after his death, they were gifted to the Art Institute of Chicago, where they have remained until the present day. The Autumn tapestry has been very professionally restored but there is still a faint line that can be seen in the photographs of it showing the outline of Marple Hall's fireplace. It's odd that in many ways this now makes it the more interesting of the two pieces and perhaps cutting it was not the crime it first seems. At least there is still a trace of Marple Hall and there are very few of those around for us to enjoy today. To see the tapestries in full colour as they are today in the Art Institute of Chicago's collection hover or click the old images from their days at Marple Hall. To find out even more about the tapestries and to zoom in close follow the links to the Art Institute's web site below the pictures. In March 2006 I was contacted by a lady called Odile Joassin, who is the Assistant Curator for the Department of Textiles at the Art Institute of Chicago. Odile was researching the history of ownership of some of the Art Institute's tapestries for a book that was being written about the tapestry collection and she had discovered The Marple Website's article about the auction of Marple Hall contents in 1929. As our correspondence developed I was excited to learn that two of the Art Institute's tapestries were clearly identifiable as those that had once hung on the walls of Marple Hall's Drawing Room. I was delighted to provide Odile and the Art Institute's then Curator, Christa C. Mayer Thurman, with scanned copies of the auction catalogue and images of the tapestries hanging in the hall before the sale. Thanks to the Charles Bellairs Journal, which mentions the tapestries, I was also able to confirm that they had been at at the hall as early as 1837. I knew that many local people would be as interested as I was to discover the existence of this fascinating link with Marple's heritage so I asked the obvious question: would it be possible to have some colour photographs of the tapestries to include on the Marple Website? At the time Christa asked if I could wait until the new book was published and although I was surprised she felt that a little web site from Marple could steal their thunder I was happy to go along with her request to wait until the book was published. Despite searching for it each year since then I managed to miss the fact that it was published in the autumn of 2008 until January 2010. On discovering this I followed up my request for some photos to use on the web site, first to Odile and Christa, who has now retired, and then through the Institute's web site, which has a form for this purpose. I am pleased to say that after considering my request the Institute have granted The Marple Website a contract free of charge to display their photographs of the tapestries via this page and on the Virtual Tour.